Dr. Elmasri is proud to be providing dental anesthesia to the Southern California area. He was born and raised in this area and it will always be his home. He graduated with a Bachelor of Science degree in Biomedical Engineering from the University of California, Irvine. 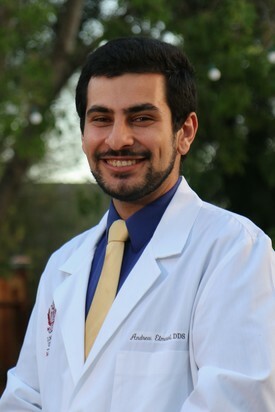 His love for the health profession attracted him to dentistry where he attended and graduated from Loma Linda University with honors in Implantology and Anesthesia. It was during dental school when he realized his passion for anesthesia and continued training at Loma Linda to complete a post-doctorate residency in Dental Anesthesia. During his residency, he received extensive training in cardiology, internal medicine, medical anesthesia and dental anesthesia. His valuable training at Loma Linda University Medical Center, Loma Linda University Children's Hospital, Riverside County Regional Medical Center and Loma Linda Veteran Affairs Hospital provided him with experience and proficiency in treating a wide range of patients with various medical backgrounds. In addition, he trained at Loma Linda University's Special Care Dentistry Center which provided him with the valuable experience of dental anesthesia treating patients as young as 12 months old and patients with a variety of special needs including: ADHD, Autism, Down Syndrome, Fetal Alcohol Syndrome, Developmental Delay, and more. "I had my wisdom tooth removed and the doctor was amazing. After being nervous about being out under anesthesia he explained all other options to me and helped me make the best decision for myself. This office least has the nicest staff and treat you like a person not just a set of teeth coming through the door." At Barsoum Dental, we understand that going to the dentist can often be scary and also has the potential to be incredibly painful. This is part of the reason why we're proud to employ one of the area's most trusted dental anaesthesiologists to ensure you get the qualified help you need in preventing and overcoming the pain of your dental procedure. A dental anaesthesiologist attends dental school like any other dentist. However, in order to become fully certified, all dental anaesthesiologists must then undergo an additional two to three year residency program in anesthesiology. During this time, the focus is entirely on general dental anesthesiology and deep sedation in order to allow a dental anaesthesiologist to assist with a wide range of dental procedures. The general anaesthesiology is vital in preventing pain during tooth extractions, dental implants and various other dental procedures. Unfortunately, simply ensuring a person that they won't experience pain from the procedure isn't enough for some people to get over their huge fear of the dentist. In fact, there are many people whose fear of the dentist stands in the way of them getting the help they need to improve their oral health. Through sedation dentistry, our dental anaesthesiologist will use an intravenous sedative to put you fully under prior to your procedure and will then monitor you throughout the procedure to ensure you don't wake up or suffer from any potential complications. In this way, sedation dentistry is an option that can ensure your fear of the dentist doesn't negatively impact your oral health. No matter what type of dental procedure you need—whether it's for functional or cosmetic reasons—it is essential that you not let pain stand in your way of reaching your oral health goals. When you choose Barsoum Dental, you can rest confident knowing that our dental anaesthesiologist will be on hand to provide the pain relief you need exactly when and where you need it.